These delicious, appetizer-sized treats are just as packed with flavor as their bigger meatloaf brother. Made from 100% Wagyu beef, they get their flavors from the addition of caramelized onions, jalapeños, and Worcestershire sauce. 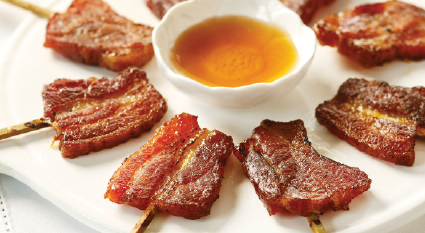 Topped with a zesty tomato and brown sugar glaze, these mini kobe meatloves are a hard appetizer to resist. Sixteen 1 oz. mini meatloaves. For best results cook from frozen. Pre-heat oven to 350°F and bake for 16 to 18 minutes. Wagyu Beef, Onion, Japanese Bread Crumbs (Wheat, Flour, Contains (% Or Less Of The Following: Sugar, Yeast, Soybean Oil, Salt), Jalapeno Pepper, Liquid Egg (Whole Egg, Citric Acid), Salt, Sugar, Sodium Phosphate, Sodium Erythorbate, Sodium Nitrate, Worcestershire Sauce (Vinegar, Molasses, High Fructose, Corn Syrup, Anchovies, Water, Onions, Salt, Garlic, Tamarind Concentrate, , Cloves, Natural Flavorings), Glaze (Ketchup, Onion, Brown Sugar, Lemon Juice, Rice Vinegar), Cloves, Spices. Contains: Wheat, Soybean, Egg, Fish (Anchovies).